The Geometric Image Processing Laboratory is a new enterprise that links applied, numerical and theoretical aspects of image processing and analysis. Work in the GIP lab is founded on the fundamental proposition that variational methods provide a unifying framework for deriving image enhancement and analysis methods. By train or bus: From South - to Hof Hacarmel Central Station and from there line 11 to the Technion From North - to Lev Hamifratz Central Station and from there (until 12:10 am) line 142 to the Technion; after 12:10 - line 123 to Ziv Center and from line 17 or 19 to the Technion. Turn off the Tel Aviv/Haifa coastal Highway 2 at the first exit for Haifa (signposted Haifa South, MATAM, Tirat Hacarmel). Right after you turn off the highway, take the left fork (to Ahuza), First turn right, at the lights turn left to Flieman Road. Go straight through two sets of traffic lights and drive up the Carmel mountain for 3 km. Half-way up the road is renamed Weinshal and renamed again Freud Road towards the top. Near the top of the hill, drive straight through another set of traffic lights. At the top of the hill, Freud Road. ends with a T-junction with traffic lights. At the junction, there are two lanes for turning left, and one slip lane for turning right. As you approach these lights, stay in the center lane. At the lights, make a left turn and an immediate right turn at the next lights onto Pica Road. 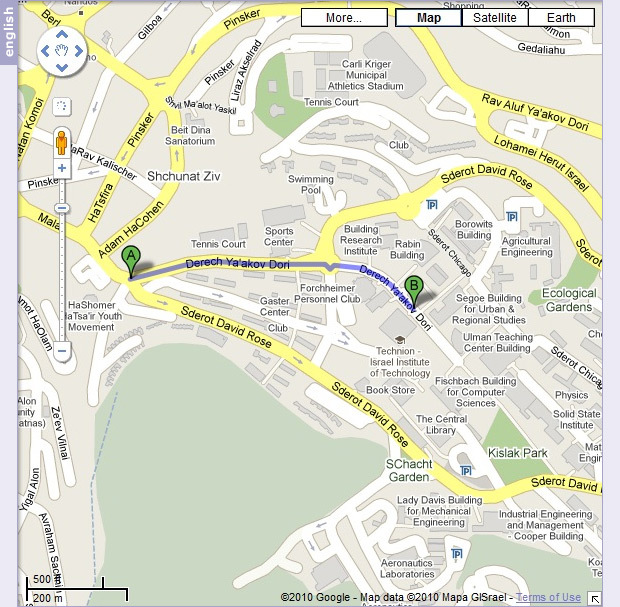 Mercaz Horev Shopping Center is on your immediate right. Driving down Pica Road, you will drive through four sets of traffic lights. Stay in the right-hand lane as you approach the yellow Paz gas station, and exit right down the slip lane, which is signposted Nawe Sha'anan, Technion. Continue straight on this road (Hankin), driving under a bridge, then move into the left lane and drive through a short tunnel. Please note: buses cannot use the tunnel, and should maintain the right lane. After the underpass tunnel, move over to the right-hand lane, and turn right into Komoy Street, signposted (orange) Technion, BEFORE the upcoming traffic lights. 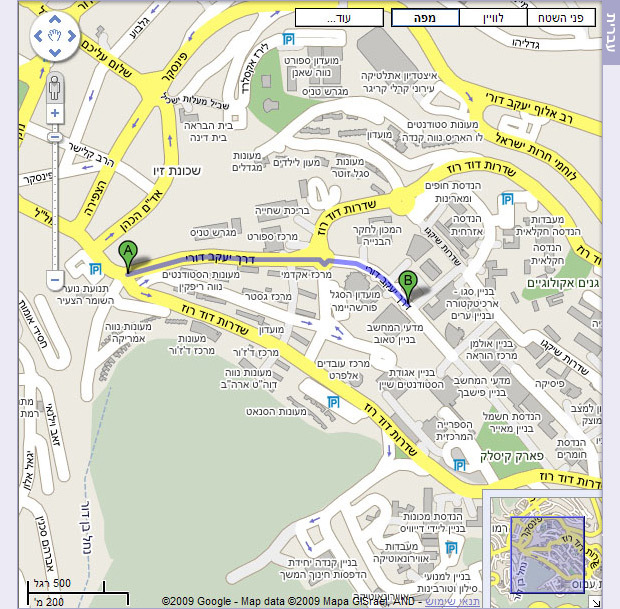 Drive up Komoy St. for about 200m and veer left through the traffic lights onto Malal St. Continue straight to the Technion campus on the left hand lane entering through the main Technion gate. At the traffic circle continue straight ahead. About 100m ahead you'll see the Taub building of Computer Science on your right.